What is a ukulele capo? A ukulele capo is a small device that attaches to a ukulele’s neck and clamps down on all four strings at once. Applying a capo raises the pitch of a ukulele by effectively moving the nut further up the neck and shortening the portion of the strings that vibrate (scale length). Putting the capo on the first fret raises the pitch by one half step, putting it on the second fret raises the pitch by two half steps, and so on. What is a ukulele capo used for? Capos allow players to perform in a higher key while using chords they’re already familiar with. Putting a capo on the second fret raises the pitch of the whole ukulele by two half steps. Now you can play the same three chord shapes as above, but the notes you hear will be two half-steps higher: D, G, and A. By raising the pitch of the entire uke, you can play the same shapes but the chords will be in a different key (D). Of course, this is a just simple example to illustrate what capos are used for. In reality, most uke players would just learn the new chords. But imagine that you wanted to take a more complicated progression like C7b9, Am6, and D+ and play them in the key of Eb. Even a skilled player might struggle to transpose these chords on the fly, especially to a less uke-friendly key like Eb. Putting a capo on the 3rd fret will easily move you into the key of Eb without learning any new chords. A capo is also helpful when trying match a singer’s vocal range more closely. Raising the pitch of your uke one or two half steps is often all it takes to make things more comfortable for the singer. Do you need a capo for a ukulele? I don’t think beginners should worry about getting a capo. It’s good to know what a capo does, but it’s a lot more important to focus on the fundamentals when you’re just getting started. An exception to this advice would be if you plan to sing a lot while you play. In this case, a capo may help certain songs a little easier for you to perform. A capo can be a nice accessory to have on hand in case you need it, but it’s probably not something you’ll be using on a regular basis. Will a guitar capo work on a ukulele? Some guitar capos will work on a ukulele, but others won’t. It really just depends on the style of the capo and how it clamps onto an instrument’s neck. Capos specifically designed for the smaller neck of a ukulele will usually work better than a guitar capo, but if you have a guitar capo lying around there’s no harm in giving it a shot. As the name implies, a spring-loaded capo uses a spring to place pressure on the strings. Most of the ukulele capos you’ll see for sale online most common type of ukulele capo is the spring-loaded style. Spring-loaded capos are easy to use and can usually be applied and moved with one hand. There’s nothing to dial in or adjust, which makes spring-loaded capos quick and simple. The simplicity of spring-loaded capos is also their biggest disadvantage. 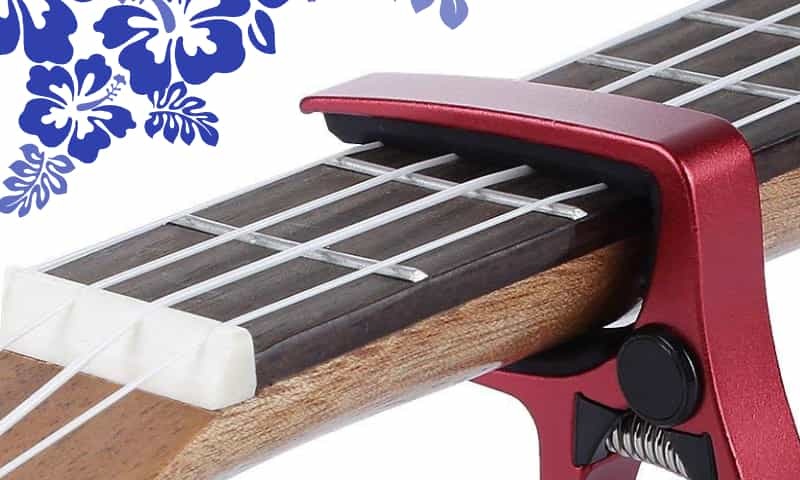 There’s no way to quickly adjust the pressure, so if the capo presses down too hard on your uke’s strings it can bend them out of tune (see box below). Other types of capos are easily adjustable and can be fine-tuned to apply just the right amount of pressure. Spring-based capos can be very affordable and can be found for as little as $5 online, but I’d recommend looking at some of the nicer brands like the Kyser pictured above. They’re a little more money, but Kyser capos are made in the USA and are very high quality. The tension of some spring-loaded capos can be adjusted by bending the lower arm. It’s not a quick fix, but it can give this style of capo a little more flexibility. Toggle capos have a design that allows the top fretting bar to lock securely onto a ukulele’s fretboard. This most popular form of toggle capo is made by Shubb, one of the best-known brands in capos. The Shubb capo uses a patented cam system that locks the capo into place with a satisfying snap. One great feature of the Shubb design is that you can easily set the tension by turning the thumb screw. Once you’ve found the “sweet spot” you can just leave it at that setting–you don’t need to reset the pressure every time. Compared to most spring-loaded capos, Shubb capos are very compact and minimal. They don’t stick out very far from the neck, and when not in use they can be stored on the headstock just above the nut. The main disadvantage of Shubb capos is that you’ll typically need both hands to apply them or change frets, making them a little slower than spring-loaded types. Shubb uke capos are available in a variety of colors. All Shubb capos are made in the USA. Elastic ukulele capos are cheap, but also the hardest to use. 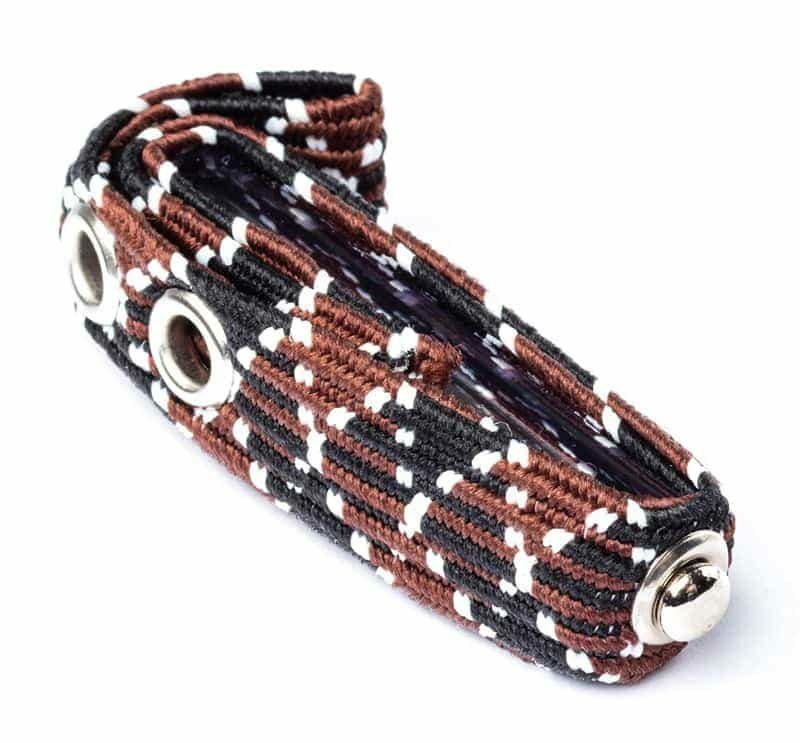 They consist of a fretting bar attached to a piece of heavy-duty elastic webbing. 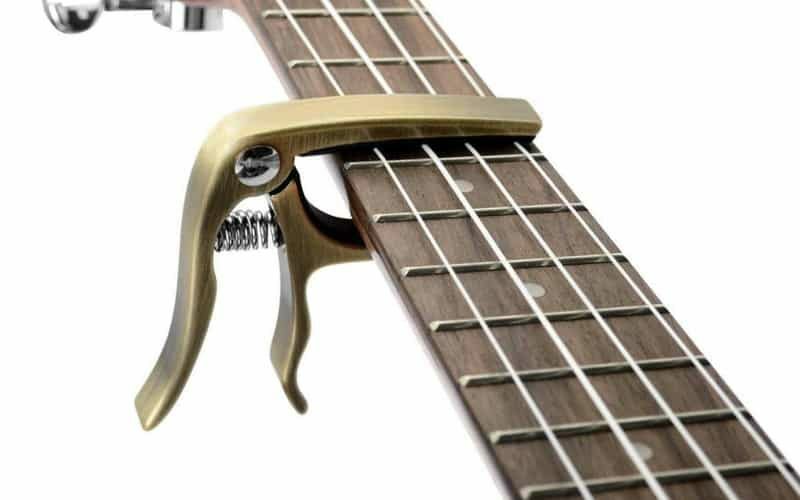 To apply an elastic capo, you have to stretch the elastic around the neck and hook it back onto the fretting bar using one of the metal eyelets. Personally, I’m not a fan of elastic capos. I think they’re finicky, hard to use, and on top of that there’s no way to easily adjust pressure. There are a couple less-common capos designs that are worth checking out. The most popular seems to be the Planet Waves NS, which is compact and can be easily adjusted while still on the neck. The G7th Newport is another interesting modern capo design that seems to offer some of the benefits of spring-loaded and snap-on capos. I haven’t personally tried these capos, but a lot of players seem to like them. Using a ukulele capo isn’t complicated: Just clamp the capo onto your fingerboard and you’re ready to go! If you’re using a spring-loaded capo, there’s not much more to think about besides placement, which I discuss below. 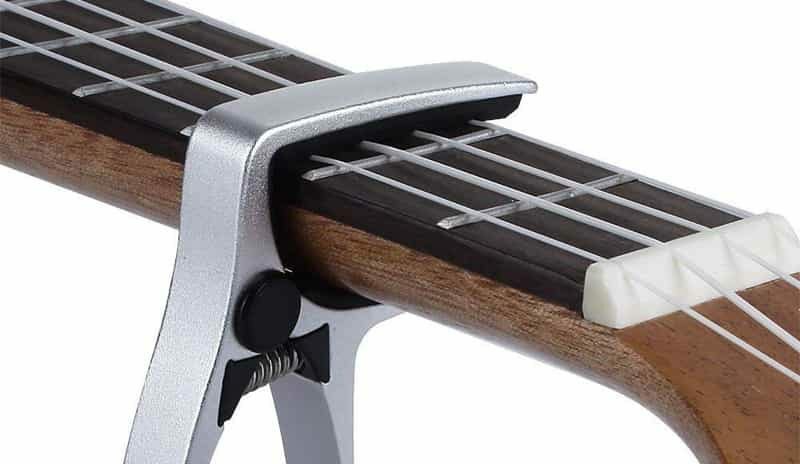 If you have a ukulele capo with an adjustable design, you may need to play with the tension a bit before the capo firmly presses down all the strings. Some adjustable capos can be changed they’re still on the fingerboard, but others may need to be removed first. The capo should be slightly behind the fret, but not too close. I usually like to see about 1/4″ of string between the fret and the capo bar, but that’s just a rough guideline. If the capo is off-center or rotated towards either side of the neck, it may not apply pressure to the strings evenly. Make sure the capo is centered and flat in relation to the fingerboard. Capo placement isn’t an exact science, and there’s no “perfect” position. I recommend just playing around until you find a spot that works best for you and your ukulele. If you hear a buzz when playing with a capo, the capo may not be fretting the notes cleanly, allowing the strings to rattle against the frets. There are a couple things you can do to fix this. Experiment with the position of the capo by moving it forward and backward or rotating it side to side. Check the tension of the capo to make sure it’s pushing down firmly enough. If you’re using an adjustable capo, tighten the screw in small increments until you get a clean tone. Don’t tighten any further than needed, since doing this can start to bend the notes out of tune. Adjusting a spring-loaded capo can be a bit more tricky. Some spring capos (like the Kyser Quick-Change) are designed to allow the user to adjust the tension by bending the lower arm. Capos from other manufacturers may not be as forgiving. Sometimes, applying a capo causes the notes to go a little sharp because the strings are pulled out of tune. Bad capo placement is often the cause, so first try backing away from the fret a bit. If this doesn’t help, try reducing the capo’s tension. This is pretty simple with an adjustable capo–just loosen the tension screw a bit. Like I mentioned above, some spring-loaded capos can be bent to change the tension, while others may be impossible to adjust. Sometimes, issues with a capo are caused by your ukulele. A uke with an unusually high or low setup is going to be more prone to problems when a capo is applied. Also, very cheap ukuleles with bad necks and uneven fretwork are may be less cooperative when trying to use a capo. I’m a fan of the high-quality ukulele capos made by American companies like Kyser and Shubb. These capos are a little more money than some of the cheap alternatives floating around online, but they work well and will last forever. The Planet Waves NS also seems to be a popular choice among players due to its minimal design and easy adjustability.